The Cassin's Malimbe Malimbus cassini is red and black in the male and all black in the female. 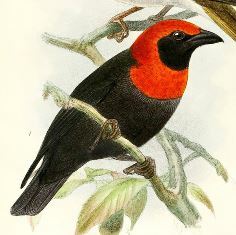 The male has a black face surrounded by a red head, collar and breast - it is similar to the Red-vented Malimbe but has a black vent. The female Cassin's Malimbe resembles the black Maxwell's Black Weaver Ploceus maxwelli and male Vieillot's Black Weaver but the eye is dark, the bill is shorter and more slender, and the feet dark in the malimbe. Cassin's Malimbe is almost indistinguishable from the female Red-crowned Malimbe, and it is best to see both male and female together to confirm identification. The immature Cassin's Malimbe has a pale red or orange head. 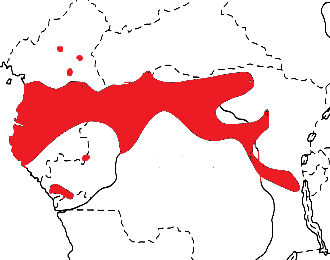 Cassin's Malimbe occurs in Cameroon, Central African Republic, Equatorial Guinea, Gabon, PRCongo, and DRCongo along major rivers (see map below, based on Birds of Africa). There are no subspecies. The Cassin's Malimbe inhabits dense, tall primary forest, often in swampy areas or in forest areas that are prone to seasonal flooding near watercourses. It is associated with wine palms, oil palms and climbing rattan palms. The Cassin's Malimbe feeds mainly on insects, including crickets and grasshoppers, mantids and moths. It has been seen feeding on fruits of the oil palm in PRCongo. It forages in pairs or small groups at middle levels and in the canopy, but may also venture into more open areas. Cassin's Malimbe regularly joins mixed-species flocks. The Cassin's Malimbe is apparently monogamous. Nest-building is initially co-operative, often with one female and several males building simultaneously. The dominant male then displaces the other birds, and remains with a female. Nest construction takes up to 15 days. The nest is very distinctive, and considered to have the most regular weaver of all weaver nests. The nest has a very long, transparent tunnel that hangs vertically downwards (up to 1 m). The nest is finely woven from stiff material. 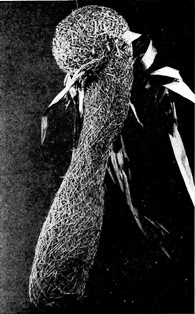 The egg-chamber is lined with green palm strips, woven in several layers of short, broad strips of material. The tunnel is woven of one layer of fine, long strips from palm fronds, with fibres projecting loosely at the end of the tube. The nest is attached 10-25 m above the ground in climbing palms or other trees. The female strips the leaves around the nest. Nests may persist for several seasons, and thus several may be seen close together, although only the newest nest appears to be used for breeding; old nests may be used for roosting. The clutch is 2 eggs, which are pure white. Incubation is by both sexes, with incubation bouts of nearly 1 hour at a time. The chicks are fed by both sexes. 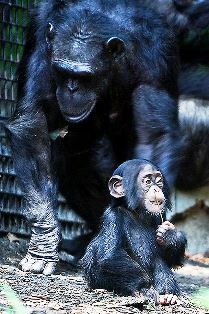 In a Gabon study, most nests were robbed by chimpanzees Pan troglodytes. There are 2 PHOWN records for the Cassin's Malimbe (see PHOWN summary), although they are of a male that escaped from captivity. Many more records are needed of this common species. Submit any weaver nest records to PHOWN (PHOtos of Weaver Nests) via the Virtual Museum upload site.